Unreal Dark Chocolate Crispy Quinoa Gems uniquely blends fair-trade 72% vegan dark chocolate with the crunchy quinoa crisps delicious snacking combination that's going to become your new addiction. 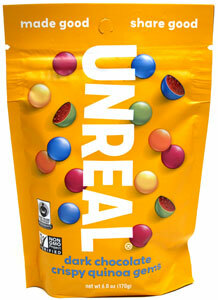 Made with GMO-free ingredients that are naturally colored with vegetables and with nothing artificial, the name may be Unreal (as is the awesome taste! ), but there's nothing artificial about what goes into these delicious little treats. Picture M&Ms® candies with the perfect bit of light crisp in every piece, and you'll know why vegans everywhere are indulging in these by the bagful! 6 oz. (170g) package is $5.19. These are so unique - the chocolate flavor is nice and milky, nothing like an M&M. The center is perfectly crispy and the serving size is unreal! Curbs the cravings in the best way.